Year-round outdoor markets for seasonal produce and goods. Each day of the week, there will be a market open somewhere within driving distance of 20-30 minutes for most regions in France. To see those words – year-round – may at first seem impossible, but it is true, and it is not just in Provence, but all over the country of France. 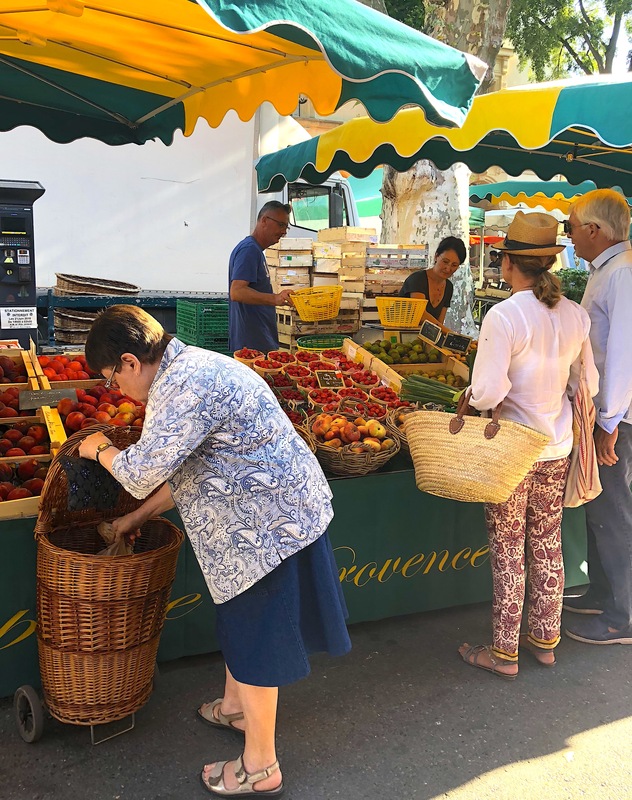 I just gained my sea-legs when it comes to market visiting while staying in Provence for two weeks this past summer (June and July), and delighted in the availability, fresh seasonal goods and conviviality of those shopping, selling and simply sight-seeing. Most markets open between 8 or 9 in the morning and have wrapped up by noon or one in the afternoon. In fact, as M.L. 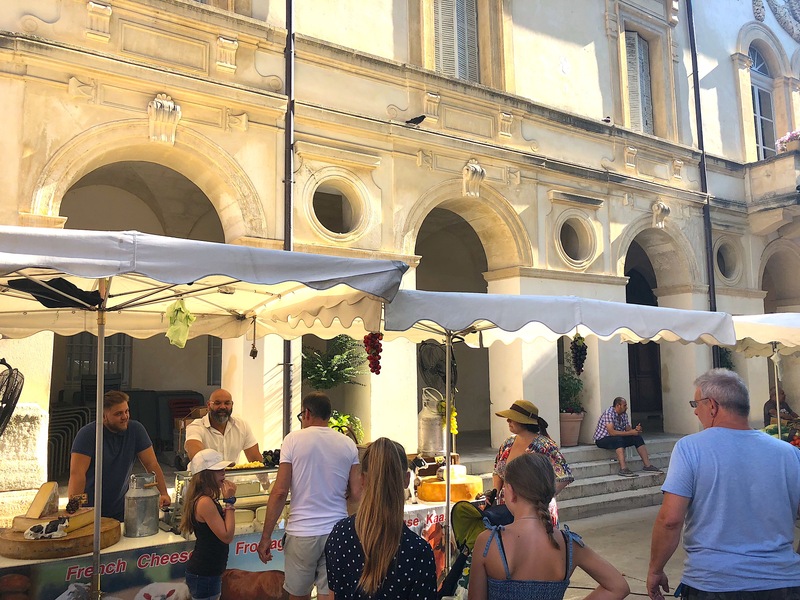 Longworth shared about one of the produce markets in Aix-en-Provence, you would hardly know there was a market in the square as the restaurants immediately set up their tables for their lunch and dinner settings. In today’s post, I will talking all about food and produce (along with some home items – such as totes, olive cutting boards, clothing, etc. ), but be sure to check out my post about Brocante Markets here as there is an entirely different list of places (sometimes they are at the same place, but often they have their own days – Sunday is very popular). Arriving early as booths have just set up will help you to avoid the crowds, but you need not arrive extremely early as you will still find what you want for most items (special items that have very short season as well as certain fish and meat cuts can go quickly if in high-demand, so in such instances, arriving early is important). 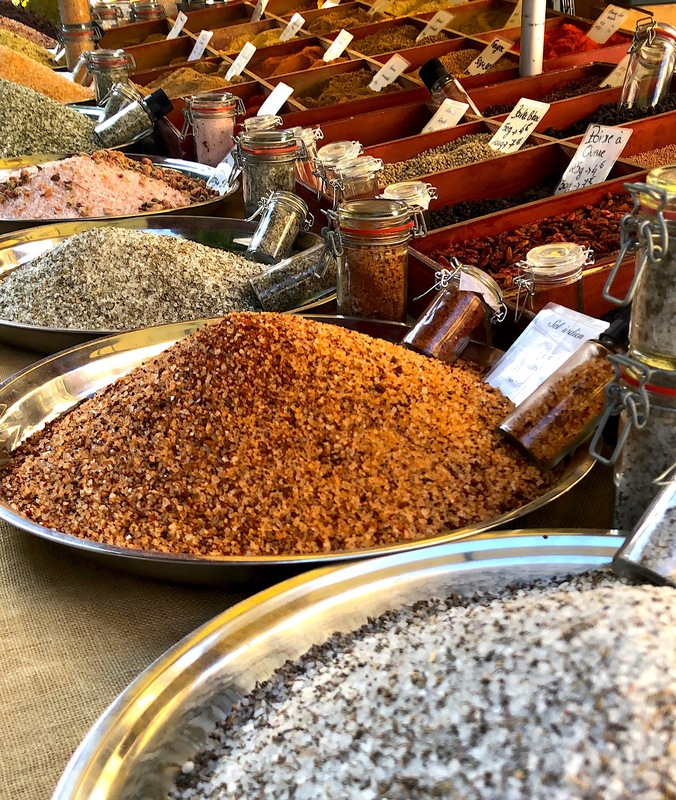 If you are traveling in the Luberon region of Provence, there is a market each day of the week somewhere in the region. Simply check this website (TheLuberon.com) to see which town is having a market day that is closest to where you are staying. 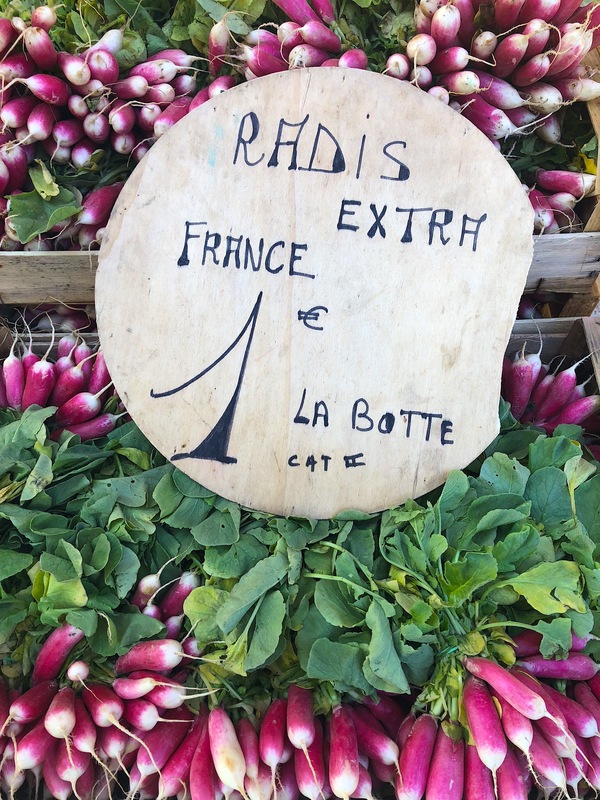 And for any region in the country check out Complete France’s guide to Market Days here. Begin with Bonjour! – Even if it is an outdoor market, this is the vendors and artisan’s space, be friendly, say hello and then begin exploring. And don’t forget to smile! – Have fun while you are at the market. I found that often the vendors enjoyed bantering playfully, especially when they realized I was American (often first assumed to be English), and as they wanted to practice their English, we would have some fun. 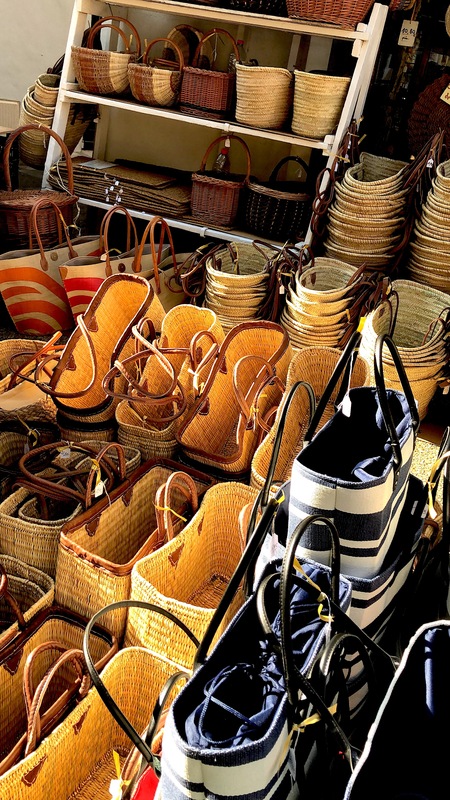 Bring a market tote, cart with wheels, or something to carry your food and goods finds. – Check out this post where I have done some shopping for you to help you find your perfect French tote even if you are not traveling to France any time soon. Don’t have a tote yet? The market is a wonderful place to find them. – At every market I visited, there were oodles of market totes. Some of the same vendors were seen, but there were always ones I hadn’t. The prices are usually under 30 Euros (unless you want an extra large tote). Do a walk-through for a duration of time – Now, if you are at for example, Saint-Rémy-de-Provence, it would take you 30 minutes or more to do a full walk-through as the booths line street after square, after alley, but at least do a walk-through to the heart of the square. Compare prices, but also compare quality of the goods. Simply because a sausage is low in price, as we were taught by Patricia Wells in Vaison-la-Romaine, does not mean, it is worth buying. Quality, Quality, Quality. Haggle (typically not on food), but be respectful – While it is expected that you will haggle, especially if you are buying multiple items, be respectful in what you offer. Vendors are making a living, and if you want to support quality produce and goods, be mindful of what you offer. After all, it is usually a starting-off point. Very rarely did I haggle with food, but I did for goods such as clothing, totes and when I purchased multiples of something. Why not on the food? The prices are generally very fair as you will see in the few images here and in the video I have created at the bottom of the post which is full of images of the produce. Leave a specific list at home. 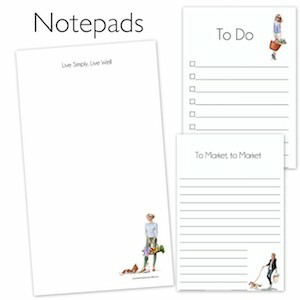 Come with a list stating, for example – items for dinner (and how much, etc. 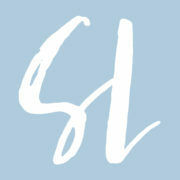 ), but let the seasonal options be your guide as to what those items will be. This will be challenging at first, but once you begin to taste the produce, have fun with the flavors and realize, good food doesn’t need much “extra”, you’ll see each visit like a treasure hunt. (Mark your calendars for September 8th (2018) when The Simply Luxurious Kitchen vodcast will debut. One of the underlying themes is to teach viewers how to do just this – shop with the seasons. In fact, the show’s tagline is seasonal fare to elevate the everyday meal. If possible, buy the heavy items first, and then the bread, eggs, zucchini blossoms and lettuce last. – Thinking of carrying your purchases, be thoughtful about how they are arranged and make it easy on yourself so you don’t have to keep rearranging. If the sun is out, where a hat. 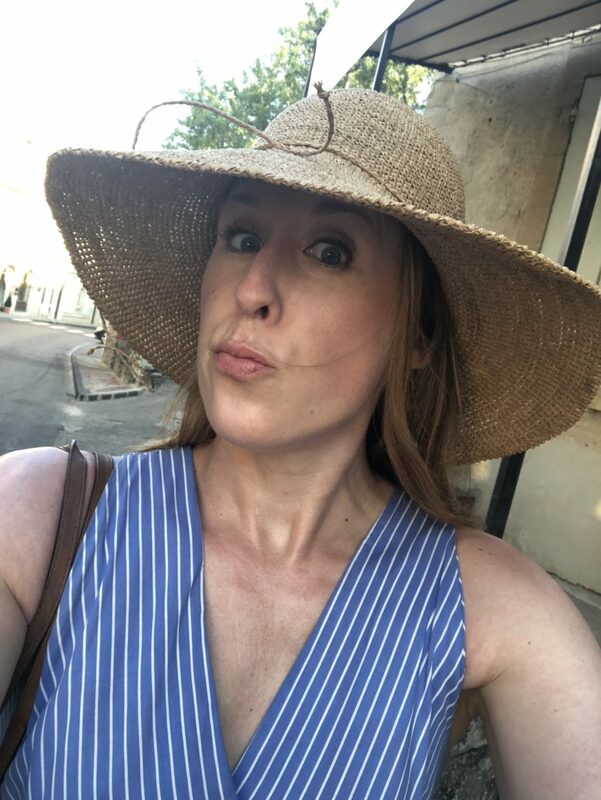 Typically I am not a hat person, but as you see below, after visiting my first market in Vaison-la-Romaine, I quickly learned that even though it is earlier in the morning, the sun is hot and bright. 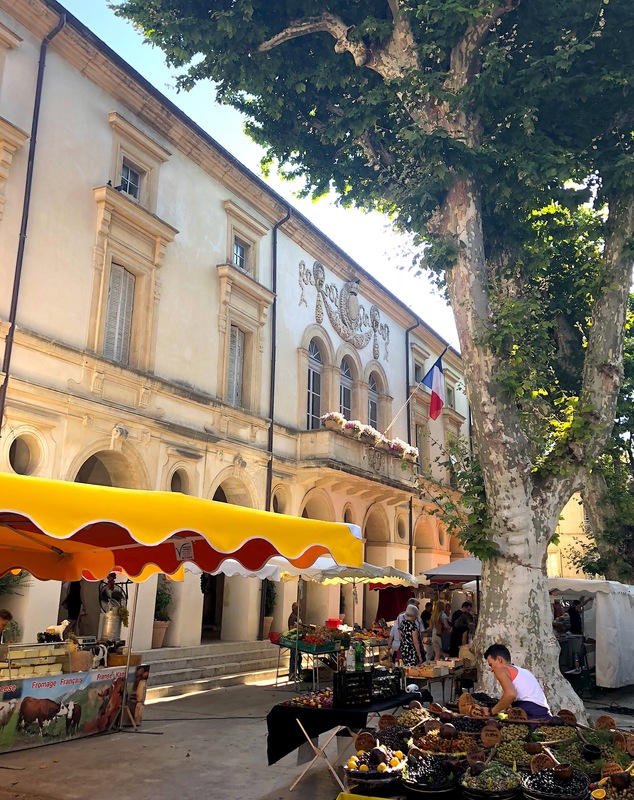 Go early for fewer crowds (Saint-Rémy-de-Provence and Sur l’Isle La Sorgue quickly became busy by 10 am, almost too much so for me – body to body in Saint-Rémy), so go early to have time to talk one-on-one with the vendors, take your time and it will be cooler as well. Learn a few key phrases to ask for something, price, etc. “Combien sont les tomates?” (How much are the tomatoes? )Combien (how much) is a great word to know and place in front of the verb and item you want to know the price of. “Je voudrais deux tomates, s’il vous plait.” (I would like two tomatoes, please.) Je voudrais (I would like) is a polite way of asking for something. And ending with “please” is a good idea as well. Find the producers of the food instead of the merchants if possible. This is smart and sometimes easier said than done if you are new to the market and don’t know any locals. But simply watch the locals. Where are the lines? When I went with Sharon Santoni to her local village to pick up bread, there were I believe three boulangeries on the street – only one had the line and that was the one Sharon was going to. There is a reason – trust the locals. I made the mistake of buying from a merchant without doing my due diligence, and the quality of the produce was less than superb. It is possible, even in France. The producers are the ones in the fields, bringing it from their farmers without the middlemen. Sometimes you can even find lower prices because there is no middleman. 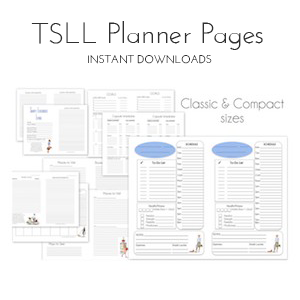 Try the samples that are offered. Why not? The vendor is confident in his/her food, and if you want to know what you might want to buy, give it a taste. Bring cash, small bills. At each market I visited (except Gordes), there was a Cash Machine nearby if I needed it. Unlike many U.S. farmers markets, the Square iPad readers for cards is not de riguer in France as of yet. Explore, learn and have fun. Even if you aren’t in the market for pigeon, have a look, ask questions and learn about a food item you have never seen in a market before. Remember even super markets will not be open on Sunday afternoon (beginning early afternoon), so make sure you have food in your vacation rental, or know that a restaurant will be open so that you have food to enjoy. I remember going to the super market just outside of Gordes on Monday morning at about 8 am because I didn’t learn this lesson until after Sunday afternoon. I have never seen a market so busy! I am not sure if there is typically a Monday rush as there is no shopping available Sunday afternoon, or if it was just the odd day. Either way, I learned my lesson – shop when the markets are open, and understand, they are not always open as they are in the states. Okay, you are set to have a successful and most importantly, enjoyable visit to your next French market no matter what time of the year you visit! 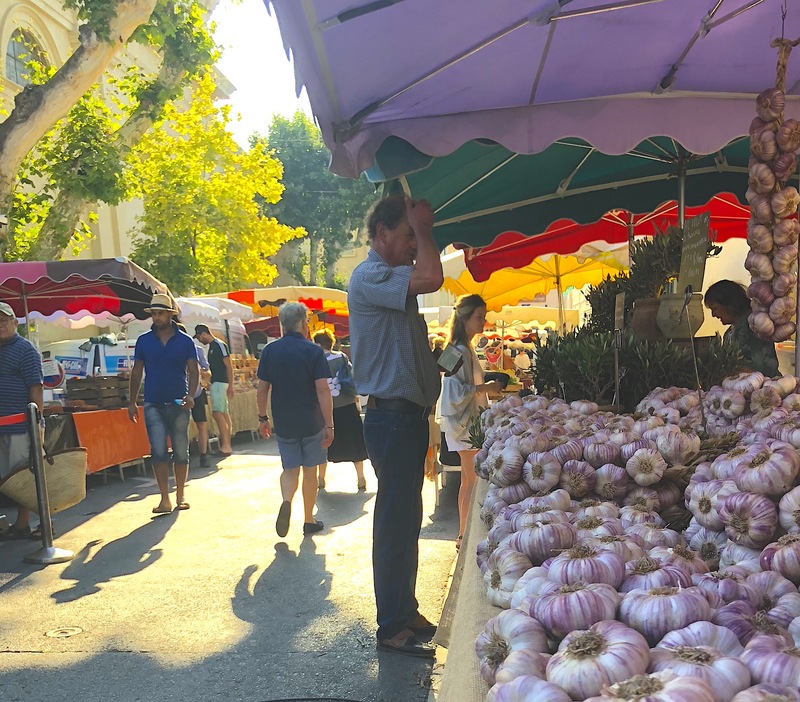 If you want even more specific insights on the markets of Provence (all types of markets), check out this book – Markets of Provence (2016) which comes highly recommended for those who have traveled to France. The author has also written a similar book for Markets of Paris(2012).